The students will work together and individually to complete a variety of fitness and sport related activities that involve the number 100. Students should have prior knowledge of a variety of fitness and sport related activities. 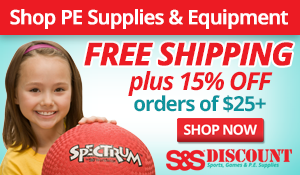 Jump ropes, hula hoops, basketballs, large beach balls, footballs, kicking tees, 100 small plastic balls of a variety of colors, a large parachute, a score board, and a music source. Begin the class by congratulating the students on being at school for 100 days. Explain that most of the activities are accomplished as a team and some are accomplished as an individual. If the total number of students ranges between 15-17 I use the the number 6 as a multiplier, if the total number of students ranges between 18-22, I use 5 as a multiplier. Higher then 22, I use 4 as a multiplier. For this list of activities I will use 5 as the multiplier to make 100. I tell the students we have 100 things to do so we move from one activity to the next as fast as possible. Encourage counting out loud as a team and counting down the seconds. Teacher observation. Check them for proper form. Add a self check prompt card of each activity for those kids that may need reminder of how to perform the task. Write all the activities on a white board and then complete the math calculations at the end of class. Change the basketball for a rubber or foam ball. Could also have lower BB goals. Hula hoop modification of having hoop on the ground and jumping in and out of it, and jump rope modifier (JR on ground, jump over it.) Assist where needed during the activities. Submitted by Russell Laub who teaches at Bessie Weller Elem. School in Staunton, VA. Thanks for contributing to PE Central! Posted on PEC: 5/1/2014. Viewed 35752 times since 3/4/2014.